Marble bust of Epicurus. Roman copy of Greek original, 3rd century B.C.E./2nd century B.C.E. On display in the British Museum, London. Epicureanism is a system of philosophy based upon the teachings of Epicurus (c. 340–c. 270 B.C.E. ), and was one of the most popular schools of Hellenistic philosophy (together with Platonism and Stoicism). It was founded around 307 B.C.E., when Epicurus began to teach. He proposed that the ultimate goal of human life was happiness, and that the greatest good was to seek modest pleasures in order to attain a state of tranquility and freedom from fear through knowledge ("ataraxia") as well as absence of pain ("aponia"). He also encouraged the study of science as a way to overcome fear and ignorance and thus achieve mental calmness. Epicurus developed a naturalist explanation of existence, combined with a system of ethics meant to guide society towards peace and tranquility. He put forth an atomist ontology, empiricist epistemology, and humanistic ethics. Epicurus set up several communities that tried to lead a philosophical life according to his ethics. Epicureans grasped that sensuous pleasure is an important constituent of human happiness, but only when it is integrated with spiritual and ethical aspects, since all human experiences are essentially holistic spiritual-physical experiences. Although the modern terms “epicure” and “epicurean” imply self-indulgent hedonism, Epicurus advocated moderation and pointed out that over-indulgence of any kind results in pain and therefore should be avoided. Epicureanism remained popular for several centuries but never entered the mainstream of philosophical thought. One reason is that it was opposed by conservatives and later was suppressed by the Christian faith. Much later, some of its teachings would play a role in the Renaissance and influence modern thinkers, particularly in the areas of civic justice and the study of physics. Epicureanism has contributed to modern thought in several important ways. One of these was the theory of “atomism” which was used by early physicists and chemists as they began to work out modern atomic theory. Epicureanism played a role in establishing the value of the individual when humanism arose as a backlash to religious authoritarianism. Another contribution was the idea that it is inherent in human nature to pursue happiness, and that an ethical society should allow every one of its members that opportunity. This idea was expanded on during the French Revolution and by thinkers like John Locke. The "pursuit of happiness" was incorporated into the United States Declaration of Independence as an inalienable right. Epicurean ethics continue to appeal. An ethical system based on maximizing "pleasure," similar to the tenet of utilitarianism, seems to transcend barriers of culture, faith and language at a time when the world is becoming a global community. 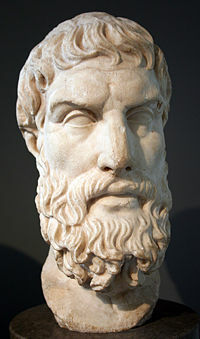 Epicurus set up his first Epicurean community in Mytilene, where he met Hermarchus, his first disciple and later his successor as head of the Athenian school. Threatened with imprisonment because of a dispute with a local official, he moved to Lampsacus, where he met Metrodorus and Polyaenus, Metrodorus’ brother Timocrates, Leonteus and his wife Themista, the satirist Colotes, and Metrodorus’ sister Batis and her husband Idomeneus, and set up a second community. In the archonship of Anaxicrates (307 B.C.E. - 306 B.C.E. ), he returned to Athens where he formed The Garden (Ho Kepus), a school named for the house and garden he owned about halfway between the Stoa and the Academy that served as the school's meeting place. An inscription on the gate to the garden is recorded by Seneca in his Epistle XXI: “Stranger, here you will do well to tarry; here our highest good is pleasure.” Unlike the other Athenian schools of Plato and Aristotle, Epicurus’ school admitted women and slaves. These communities set out to live the ideal Epicurean lifestyle, detaching themselves from political society, and devoting themselves to philosophical discourse and the cultivation of friendship. The letters, which members of these communities wrote to each other, were collected by later Epicureans and studied as a model of the philosophical life. In his will Epicurus left the house and garden and some funds to the trustees of the school, and upon his death, Hemarchus became his successor. Polystratus, who was the last surviving member of the school to have personally known Epicurus, followed him. The Garden continued to exist in some form for several centuries, until all four Athenian schools were closed by the Emperor Justinian in 529 C.E. Epicurus’ writing was said to fill 300 rolls, and at least 42 of his works, including the 37 books of On Nature, were circulated at the time, as well as 12 books by Metrodorus and four by Polyaenus. Only fragments of Epicurus’s prolific manuscripts remain, including three epitomes (Letter to Herodotus on physics, Letter to Pythocles on astronomy, and the Letter to Menoeceus on ethics); a group of forty maxims, mostly on ethics; and papyrus fragments of his masterwork, On Nature. Many of the details of Epicurean philosophy come to us from doxographers—secondary sources and the writings of later followers. In Rome, Titus Lucretius Carus (99 or 94-55 B.C.E.) was the school's greatest proponent, composing On the Nature of Things, an epic poem, in six books, designed to recruit new members, which offers detailed instruction on several Epicurean theories, including atomism, infinity, mortality, fear of death, fear of the gods, and sensation and the torments of desire. Epicureanism came under attack from Cicero, whose critiques of Epicurean arguments actually served to preserve them for posterity. An ancient source is Diogenes of Oenoanda (c. 2 C.E.) who composed a large inscription in stone at Oenoanda in Lycia. A library, dubbed the Villa of the Papyri, in Herculaneum, owned by Julius Caesar's father-in-law, Lucius Calpurnius Piso Caesoninus, was preserved by the eruption of Vesuvius in 79 C.E., and was found to contain a large number of works by Philodemus, a late Hellenistic Epicurean, and Epicurus himself, attesting to the school's enduring popularity more than 300 years after his death. The task of unrolling and deciphering the charred papyrus scrolls, begun in the 1700s, continues today. Epicureanism grew in popularity and it became, along with Stoicism and Skepticism, one of the three dominant schools of Hellenistic philosophy, maintaining a strong following until the late Roman Empire. It never entered the mainstream of ancient political life, partly because it was highly critical of everything that did not advance the “greater good” according to Epicureanism. However it continued to be an important influence for several centuries. Epicureans of the second century B.C.E. include Demetrius of Lacon, and Apollodorus, who wrote 400 books. His disciple, Zeno of Sidon, also wrote prolifically and was heard by Cicero in Athens in 79 B.C.E. Phaedrus, another of Cicero’s teachers, was in Rome in 90 B.C.E., and Patro was head of the school until 51 B.C.E. Surviving fragments of a first century B.C.E. treatise, On Signs, by Philodemus, show that there were sophisticated debates on induction between Epicureans and Stoics. The first person to write about Epicureanism in Latin was Amafinius. Titus Lucretius Carus wrote On the Nature of Things during the first century B.C.E. Epicureanism and became well established in Italy in the first century C.E., under the patronage of Roman aristocrats. After the assassination of Julius Caesar, Epicureanism became unpopular among the Roman governmental elite, but flourished in other parts of the Roman Empire, such as Turkey, where in the second century C.E., Diogenes of Oenoanda carved Epicurean texts on a stone wall. Fragments of a polemic against the Stoic Chrysippus by Diogenianus, another Epicurean of the second century C.E., are found in The History of the Church by Eusebius (263-339 C.E.). Epicurus' theory that the gods were unconcerned with human affairs had always clashed strongly with the Judeo-Christian concept of a monotheistic God, and the philosophies were essentially irreconcilable. In Talmudic literature, the word for a heretic is "Apikouros." Epicureanism was routinely attacked in Christian texts of the mid-second century C.E. Lactantius criticizes Epicurus at several points throughout his Divine Institutes. After the Emperor Constantine declared Christianity an official religion of the Roman Empire in the third century C.E., Epicureanism was suppressed. For several centuries the only fragments of Epicureanism to be remembered in Europe were those that the church chose to preserve. In the fifteenth century, intellectuals began to take an interest in the Greek and Roman classics, and Italian humanists began circulating translations of classical works. In 1414, Poggio Bracciolini rediscovered Lucretius’ epic, On the Nature of Things, in a German monastery and sent a copy to Italy. It was published in 1473, after the invention of the printing press. Epicureanism was revived as a philosophical thought system in the seventeenth century by Pierre Gassendi, who constructed a neo-Epicurean atomism to challenge Descartes’ theories. Gassendi’s works influenced several English intellectuals, including John Locke, Isaac Newton, Robert Boyle and Robert Hooke. Epicurean ideas helped lay the foundations for the theory of modern physics, chemistry and astronomy, and contributed to classical liberalism in political theory and atomistic empiricism in philosophy. Newton included 90 lines from On the Nature of Things in his writings on the concept of inertia. The transition, during the Period of Enlightenment, from superstition, alchemy, and political and religious authoritarianism to modern science and physics, religious freedom and democracy, owes a great deal to the teachings of Epicurus. Epicurus was one of the first thinkers to develop the notion of justice as a social contract. He defined justice as an agreement "neither to harm nor be harmed." The point of living in a society with laws and punishments is to be protected from harm so that one is free to pursue happiness. Because of this, laws that do not help contribute to promoting human happiness are not just. This was later picked up by the democratic thinkers of the French Revolution, and others, like John Locke, who wrote that people had a right to "life, liberty, and property." To Locke, one's own body was part of their property, and thus one's right to property would theoretically guarantee safety for their persons, as well as their possessions. This triad was carried forward into the American freedom movement and Declaration of Independence by American founding father Thomas Jefferson as "life, liberty, and the pursuit of happiness." Jefferson was an avowed Epicurean in his later years, and set out his views in his Letter to William Short. Karl Marx's doctoral thesis was on "The Difference Between the Democritean and Epicurean Philosophy of Nature." Epicurus was also a significant source of inspiration and interest for Friedrich Nietzsche. Nietzsche cites his affinities to Epicurus in a number of his works, including The Gay Science, Beyond Good and Evil, and his private letters to Peter Gast. Epicurus' doctrines continue to have a general appeal to modern intellectuals, as evidenced by a recent revival of Epicurean-oriented individualism in political and philosophical thought, as well as in pop culture. Jeremy Bentham and others developed utilitarianist ethical theory based upon the idea of maximizing pleasure. We can see conceptual affinity between Epicureanism and utilitarianism, one of the most popular ethics today.